The Canadian Centre for Court Technologies (CCCT) has put together a team with the assigned mandate to develop "an on-line Clearinghouse for information on technology and the courts". Members of this team include: Louise Hamel, David Whelan, Diana J. Lowe, Brad Albrecht, Gordon R. Kelly, Dominic Jaar, and Olivier Jaar. One of the initial steps in their planning efforts is a quick 5-minute survey for members of the Canadian legal community. Please consider taking part prior to their deadline of December 3rd. Once again, it's nice to see law librarians embedded within the CCCT's online agenda. Dominic Jaar does a great job of keeping each stakeholder group involved, including the regular participation of librarians. And while I'll disclose that I've helped (mildly) in an advisory capacity in the past, I would feel this way in any event -- the level of respect that the CCCT shows our profession should be commended. We've had two exciting announcements today over at Stem. 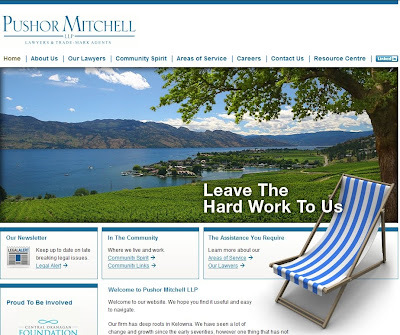 First, late this morning, we launched a new website design for McClanahan Myers Espey LLP; and now just a few minutes ago, we formally welcomed Kelowna law firm Pushor Mitchell LLP into the Stem fold. And what can I say about working with one of BC's most respected law firms? Kelowna Corporate Citizen of the Year, 2009 CBA-BC Work-Life Balance Award... We are very excited about working with a firm like Pushor Mitchell! Interesting new OS cloud service Omeka.net is based on Wordpress, but offers a scalable solution for web collections. Annual pricing plans range from $25/yr to $1000/yr. "Museum archives and scholarly collections have a new home online with yesterday’s release of Omeka.net Beta, a cloud-based Web-publishing platform from the Center for History and New Media at George Mason University. Seems like a reasonable cost for a hosted solution, and a good alternative for those not interested in downloading & configuring the free version.